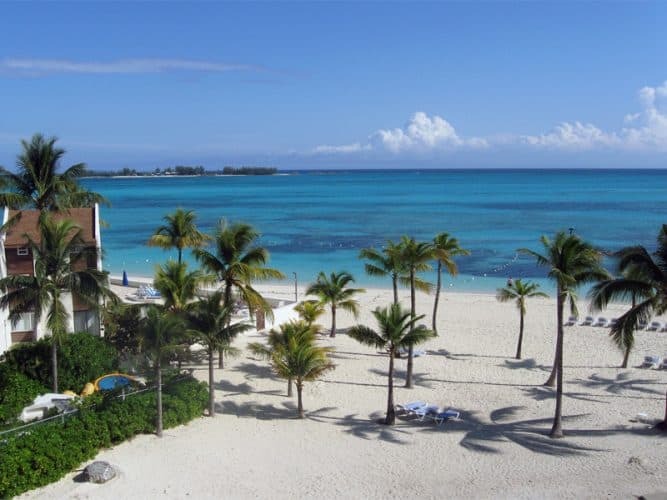 Travel guide on the best beaches in Nassau, Bahamas catered towards those on a cruise vacation. Covering locations and things to do there. Nassau, Bahamas’ capital city is the island’s most popular destination and for good reasons too. While it’s known for its beautiful historical town, interesting attractions, food, and culture this lovely Caribbean city also has some of the best beaches in the Bahamas. You would be forgiven for thinking that you have to skip town to find a beautiful, tranquil beach in the out islands of the Bahamas but truth be told Nassau also has its secret beaches that are just as nice if not more. And for a cruiser, the beaches in Nassau are more attractive due to ease of accessibility and the convenience they offer. So, don’t skip town before you check out this 15best beaches in Nassau, Bahamas. First, stop Junkanoo Beach!! This is literally the first beach you might set foot upon as it’s located just 15 minutes from the cruise port. Junkanoo Beach is a popular party beach found a walking distance from Prince George Wharf. It’s named after the most popular festival on the island and truly embodies the festive culture of the locals. As such, it always has a vibrant atmosphere. This beautiful stretch of pristine white sandy beach with warm shallow crystal clear waters is the major reason why Junkanoo beach is so beloved. However, being so close to the cruise port and downtown Nassau means that this is a busy tourist beach. If you want to avoid the crowds you are better off heading further west to less crowded beaches or to the quiet overlapping stretch that is West Esplanade Beach. In terms of amenities, Junkanoo beach has it all. It has clean bathrooms, restaurants, water sports rentals, and a lifeguard. 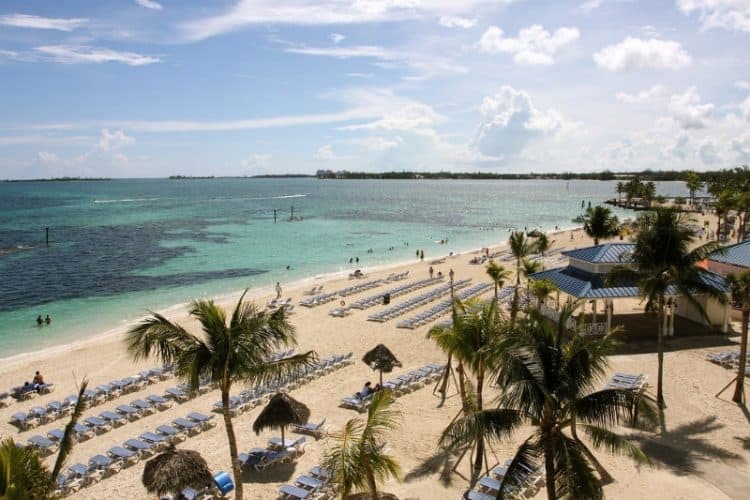 Picture over 2 miles of silky white sandy beach with crystal clear turquoise waters and gentle breezes beset against a row of high-end luxurious beach resorts. That’s what Cable Beach is all about. This beach located just 3miles west of downtown Nassau is one of the most popular beaches in the Bahamas. If you love the sun, sand, and sea then this pristinely white sandy beach will make for a perfect beach getaway. Cable Beach has all necessary amenities available and offers a gamut of popular water sport rentals such as kayaks, banana boats, jet skis, and SUPs. The beach is easily accessible. From town take the Jitney bus or a taxi over to the beach. The bus charges $1.25 per person and takes about 20minutes to get to the beach from downtown Nassau. Note that because of the beach’s charm, ease of accessibility and convenience it does get pretty crowded. Thus, there are many vendors on the beach selling just about everything including umbrellas and chair rentals. You can indulge them or just give a polite but firm no and they will leave you alone. Saunders Beach is a nice family beach found between downtown Nassau and cable beach on West Bay Street. The beach which features soft white sands is popular for its calm clear waters that are perfect for swimming, playing or snorkeling in. Saunders has clean bathrooms and a nearby gas station where you can get snacks. One great thing about this beach is that despite its proximity to town it’s not crowded at all. You are likely to find a handful of people at the beach. Best of all, there is always a security guard patrolling the beach so your safety is assured. If you have kids, you will love it here. The waters are shallow and gentle enough for the young ones to swim in and there is a little playground for them when they want to take a break. You can get to Saunders by taking the number 10 or 12 Jitney busses for a fixed fare of $1.25. To alight, just tell the driver where you are going or shout ‘bus stop’. 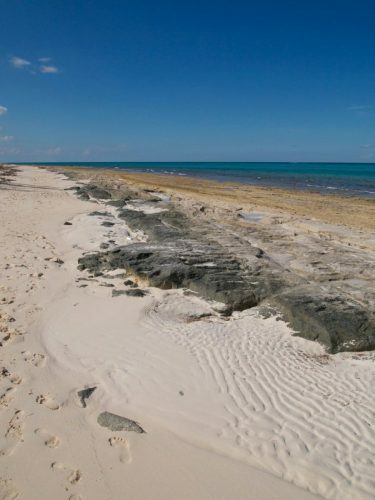 On your way to the popular Cable Beach, stop at Goodman’s Bay Beach (the eastern part of Cable beach). This is the less crowded side of Cable beach and where you can relax without all of the resort’s hullabaloo. Goodman’s features a wide stretch of soft white sand and has plenty of shade from an abundance of casuarina trees on the beach. It will take you about 15 minutes to get to Goodman’s from downtown Nassau. Again, you get to this beach by taking the number 10 Jitney bus or taxi. There are no amenities on Goodman’s beach apart from clean washrooms. But you can always walk over to the resort area and book a day pass. The water at Goodman’s is crystal clear and good for snorkeling but always check with a local beach authority about the safety of swimming in any beach. Sandy port beach located west of Cable beach is a small resort beach that is just fantastic. This place and its surrounding environment is breath-taking. The soft white sand and crystal clear turquoise waters just beckon you to come out and lie on the sand or take a dip in the waters. It’s located at the Sandy Port Beach resort a gorgeous resort with a canal running between the resort’s and residential area’s properties. This magical place is a must visit. While there you can visit the Blue Sails hotel to enjoy delicious ceviche, fish fritters, and conch salad. 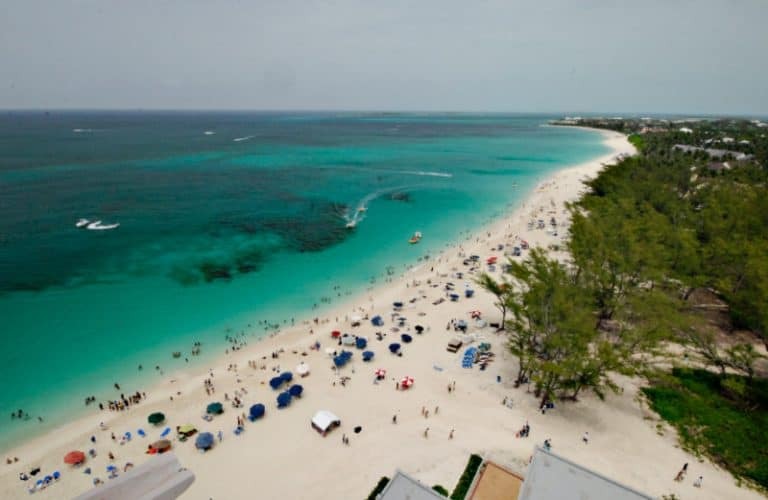 Love beach is an incredible snorkeling beach located about 10miles west of Downtown Nassau past Cable beach. 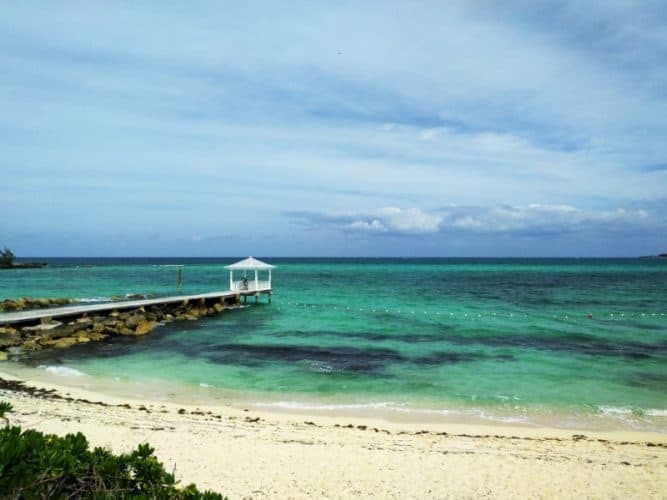 This beautiful beach is found in an upscale residential area in the northeastern sides of the island and features a stunning 40 acres of coral reef about a mile offshore. The coral reef and rocks found offshore acts as a barrier which protects the beach from strong waves. This, in turn, creates crystal clear calm shallow waters perfect for swimming and snorkeling. Love Beach’s reef is fertile with colorful fish and marine life and offers a nice snorkeling experience for all types of snorkelers. When hunger pains strike head on over to Nirvana, a restaurant on the beach which serves up popular Caribbean dishes and drinks. It also rents chairs at $5. The number 10jitney bus will still get you here from downtown Nassau and drop you at the beach’s access point. When going back, you will get the same busses or a taxi at the beach’s entrance. Please note the buses stop running at around 5p.m so plan your time wisely. Pack your snorkeling gear and other beach paraphernalia and go enjoy a great day on Love beach. This beach rarely gets crowded so you are guaranteed a tranquil beach experience. If you are looking for an off the beaten path beach, then Jaws Beach is it. Jaws is found in the North Western Coast of New Providence Island in the Clifton Heritage Park. This beach along with the water, wetlands and nature trails in the area are protected by the park. Jaws beach got its name from the third series of the movie Jaws and is a fascinating beach to escape to. The waters are warm and shallow which are excellent for a number of activities especially snorkeling. The nearby reef has plenty of colorful marine life providing good snorkeling opportunities. Apart from the lovely beach and the famous name, the beach is also known to feature the largest underwater sculpture. You can only get to this piece of paradise by taxi or a car rental. It takes about 30minutes to get here from downtown Nassau. Please note that there are no amenities here, so pack everything you might need to enjoy a perfect day on Jaws beach. This secluded lovely beach boasting of warm shallow waters perfect for swimming in– is arguably the most unique beach in Nassau and feels more like an out island beach than a city beach. This is especially so with its scenic tropic setting and shady beach area covered by native trees. Adelaide is approximately 11 miles from downtown Nassau. You can visit via taxi or rented car. This beach, though public, has zero amenities so you might want to pack lunch, drinks, and all the necessary beach accessories. Coral Harbour is an unpretentious tropical beach in the southwestern coast of New Providence Island. This private secluded beach is found on the private development of the Coral Harbour Beach Resort. So, to access the beach, you have to contact the resort and arrange for a day pass which includes meals and water sport gear rentals. Or drop by and grab a drink or lunch from the resort in order to use its facilities. Coral Harbour beach has a silky soft sandy beach with warm shallow crystal clear blue waters. It’s a nice place to just lie back in a hammock and enjoy the Bahamas breeze while reading a book. The waters are also beautiful and a major draw to the beach. You can take a refreshing dip in the shallow waters, swim and float around. You can get to Coral harbor via taxi, or by rented car. So, you have been to Cable beach and have found it very crowded and are looking for a nearby secluded alternative? Then that will be Caves Beach. Caves Beach located little ways east of downtown Nassau is a small stretch of crescent soft sandy beach lined by an old limestone wall dotted with caves. This beach rarely gets crowded and is simply the best place to get away from the bustle and hassle of the town. The caves in the area add to the charm of the beach and act as the perfect photo background. Unfortunately, there are no amenities on this beach but luckily the beach is conveniently located near the popular dining scene at Arawak Cay where you can get delicious fish fry. Take a taxi from downtown to get to this charming little beach. 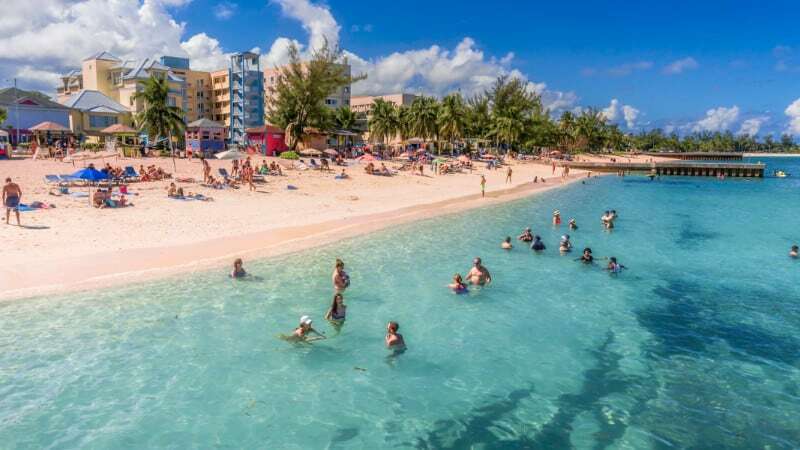 Montagu beach located 2 miles from downtown Nassau and 1mile from paradise island is not only famous for its soft sandy beach with crystal clear waters but also the historical fort in its proximity. It sits at the most historical point of the island in Fort Montagu. The Fort built in 1741 bears most of New Providence’s history and was built to protect the harbor’s eastern entrance. Montagu is a lovely local beach with smooth white sands and warm shallow crystal clear emerald waters. With the beach being a popular local lunch break area, you can be sure to enjoy some of the best local dishes on the island from the food vendors in the area. Some of this beach’s amenities include a small kid’s playground perfect for your young ones to take a break on. There is also a park nearby that offers a much-needed respite from the hot Bahamian sun. All in all, this is a nice beach stop that is highly recommended. Paradise beach is a mile of soft white sandy beach with crystal clear turquoise waters near Atlantis resorts in Paradise Island. Paradise beach just like other beaches in paradise island is a pristinely beautiful beach perfect for beach bumming, swimming, sunbathing or undertaking fun water sports. The beach doesn’t have much in terms of amenities, so, carry all that you will need for a beach day here and find a nearby beach restaurant to patronize for easy access to bathrooms and showers. Cabbage beach has been severally named one of the most beautiful beaches in the Bahamas and the world as well. It is found in Paradise Island Nassau, between the Atlantis hotel and the Paradise Island Resort. The 2 mile stretch of beach features pristinely soft white sandy beach with crystal clear turquoise water fringed by swaying palm trees and lined by some of the most luxurious resorts and celebrity homes in the Bahamas. Cabbage beach is public and has vendors renting chairs and umbrellas but if you want to access bathrooms and showers you should buy drinks or lunch from one of the many restaurants at the resorts. This beach has everything for everyone including a full range of water sports concession on its western edge. Here is where you can rent jet skis, paddle boards, go parasailing or even kayaking. This side of the beach is definitely busier and more crowded. So, to access a less crowded area of the beach moves further north. Be careful to swim within the denoted areas under the watchful eyes of lifeguards. The water here is pretty but very dangerous. You can walk to this beach from downtown Nassau or take a taxi here. Cove beach is a nice cove of soft white sands with crystal clear turquoise waters west of Cabbage beach on Paradise Island. This beach is named Cove beach after the Atlantis Cove Resort built on this beach. To get to this beach, head west from Cabbage Beach. This lovely secluded beach is the perfect place to relax, unwind and enjoy the perfect beach day. Since this stretch of beach is in front of the Atlantic Cove property the lounge chairs and umbrellas are strictly for the resort’s guest. You can try one of the nearby restaurants for lunch to access its restrooms and showers. Arawak Beach is a secluded beach in a posh suburb southeast of the island. It’s located in Paradise Island near Paradise Golf Course at the junction of Ocean Club Drive. This soft white sandy stretch of beach boasts of crystal clear warm shallow waters perfect for swimming and snorkeling. 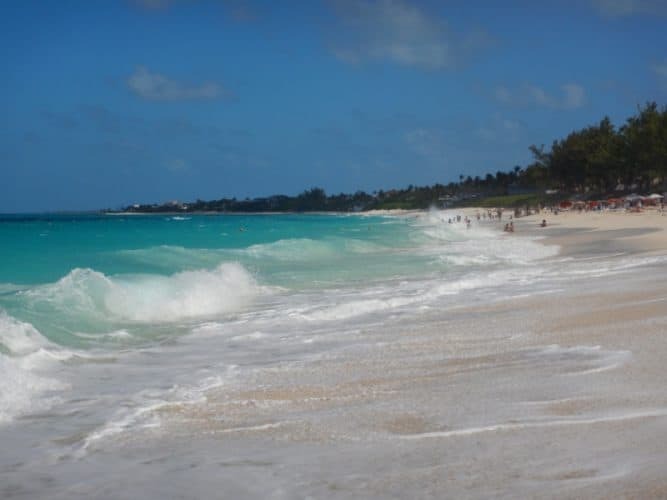 If you are feeling adventurous and are out to discover secluded beautiful beaches in Nassau, then definitely take the trip to Arawak Beach you will love it. You can easily get to this beach which is about 3 miles away from Downtown Nassau by scooter, a rental car or taxi. Please note there are no amenities on Arawak beach, so carry packed lunch and drinks. For bathrooms and showers, you can visit a nearby restaurant. 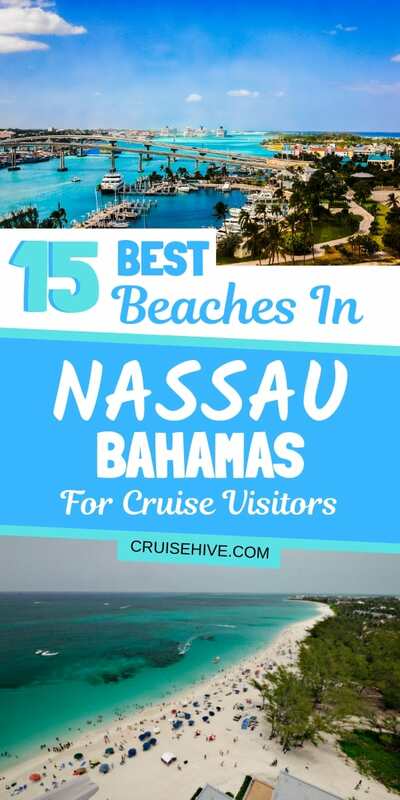 Apart from these 15 beaches, there are many other beautiful beaches in and around Nassau that are accessible to cruise visitors. 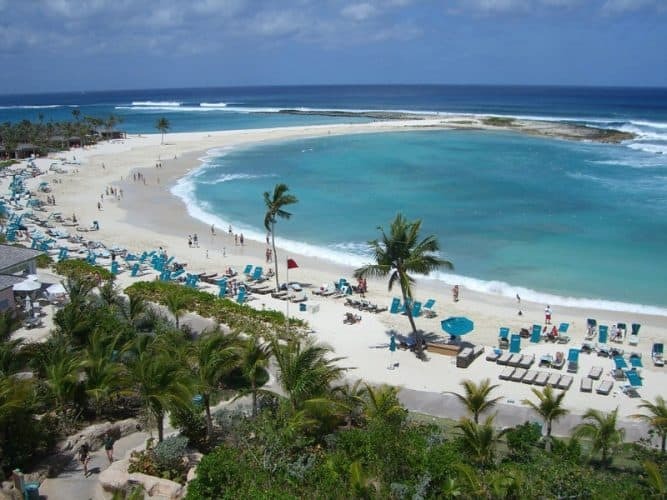 Some of these beaches include lovely secluded stretches of talcum-soft white sandy beaches in the islands of Balmoral and Blue lagoon located just a few miles offshore. Most cruise lines visiting Nassau offer excursions to these islands but you can always look for cheaper alternatives from reputable local tour operators. Remember, pick what suits your interests best and just relax and enjoy your beach break. Happy Cruising!! It's time to find out more about Nassau, Bahamas and all the things you can do at one of the most popular cruise destinations in the industry! We've got some cruise tips on why you should visit Disney Cruise Line's private island of Castaway Cay, Bahamas. Find out things to do and details about the stunning cruise destination. 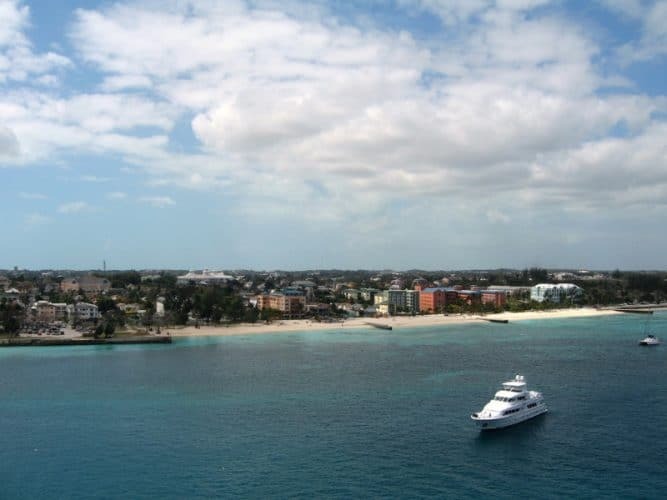 If you're thinking of taking a cruise which includes a visit to Freeport, Bahamas then here are 10 things to do so you can have the best experience.